NoCo PDA is an all-volunteer team of citizen advocates speaking up for prairie dogs and the prairie ecosystem throughout Northern Colorado. Along with inspiring more people to act on behalf of this important animal, we encourage and support other wildlife advocates as they find their unique and powerful voices. NoCo PDA came together in part through the 2016 citizen-led effort to save two prairie dog colonies in Fort Collins. Check out this lovely short film to learn more. If it inspires you to get involved, we want to hear from you! NoCo PDA will come to your group or classroom to talk about prairie dogs and their role as a keystone species. If you're interested in learning about them, including what you need to know to debunk myths, get in touch at info@nocopda.org. NoCo PDA advocates for the conservation and relocation of urban prairie dog colonies in Northern Colorado. Until we find a way to coexist with these highly intelligent animals whose survival is linked to the survival of many prairie species, relocation is the only humane solution. Are you a developer, landowner, farmer or rancher who wants to advance alternatives to killing prairie dogs? Killing is not the only way as this story about a new development in Loveland attests. 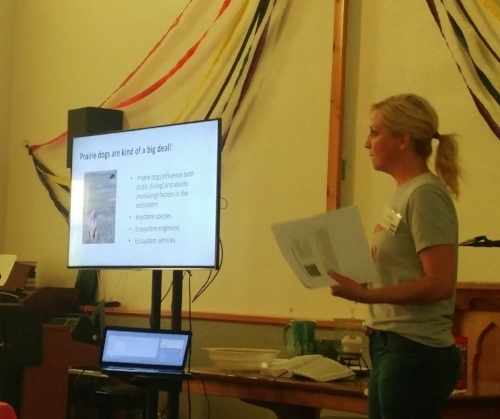 We are proud to have played a small role in making this happen, by attending one of the first neighborhood meetings and speaking up for the prairie dogs living onsite. Are you a private landowner who would like to provide sanctuary for a colony? Do you want to join us to establish meaningful change for NoCo's existing prairie dog colonies? If you're interested in creating positive solutions for prairie dogs, please contact us!